When Weston was first born, Eric's parents live many states away and weren’t able to come meet their new grandson for three months. Though they live far away, Eric and I have come up with many ways to include them in Weston's life over these past eleven months. We’re lucky to be living in such a technological age, which allows for far-away grandparents to be part of their grandchild’s daily life. Shortly after delivering Weston, Eric called his parents on FaceTime via the iPhone, and they got to not only hear about their new grandson, but see his tiny face as well. The next day, as we were waiting around the hospital, we called my father-in-law on FaceTime, and he could watch his grandson sleep, be held, and yawn those adorable baby yawns. It was comforting knowing my father-in-law was “in the room” with us and soaking up those special moments. We are big advocates of FaceTime (or Skype), and invested in an AppleTV, so that we could FaceTime through our television; this way, Weston can crawl around the living room, and do his normal playing, while my in-laws watch, and Weston can see them on the big television, instead of the computer screen. FaceTime is extremely precious to us, because we are able to call up my in-laws from the park, the beach, a walk, the doctor’s office, and have them experience the moment with us. We utilize video-chatting not only to talk to each other, but to have family-activity time, as well. My father-in-law and Eric both play music, so we let my Weston play with his toy instruments as he watches and listens to his father and grandpa play guitar together. Sometimes we even keep the FaceTime on so my in-laws can “join in” at dinner time and watch my son eat; though we can’t be at the same table, that’s the next best thing! Because we only see my husband’s family a few times a year, I wanted to introduce my Weston to distant family members in various ways, so he would remember who everyone was when we did see them in person. I downloaded a flashcard app for my iPad, and imported pictures of all the distant relatives and added their names. Weston and I flip through the flashcards learns not only everyone’s names, but their faces, as well. My in-laws aren’t here for every special moment, so to include them, I occasionally get photo books made and shipped to them. While, I do email photos almost daily, the photo book is a nice piece of memorabilia which the grandparents can flip through and watch their grandson grow. Some books even have a voice-recording element, so one could record a grandparent singing lullabies, or reading a story to their grandchild; even in the grandparent isn’t there to tuck them into bed, they can still be part of the bedtime process. Though it seems like a small gesture, just sending a photo to the long-distant grandparents means a lot to them. I try to send daily photos Weston in action, playing, crawling, eating; I want his grandparents to see what his daily life is like. I have an app on my phone, which I can upload 100 photos and have a book made, for only a few dollars more a month, you can have a book made and sent to the grandparents, as well. As Weston grows up, I want him to know that although Eric's family doesn’t live near us, they are well aware of everything happening in his world. 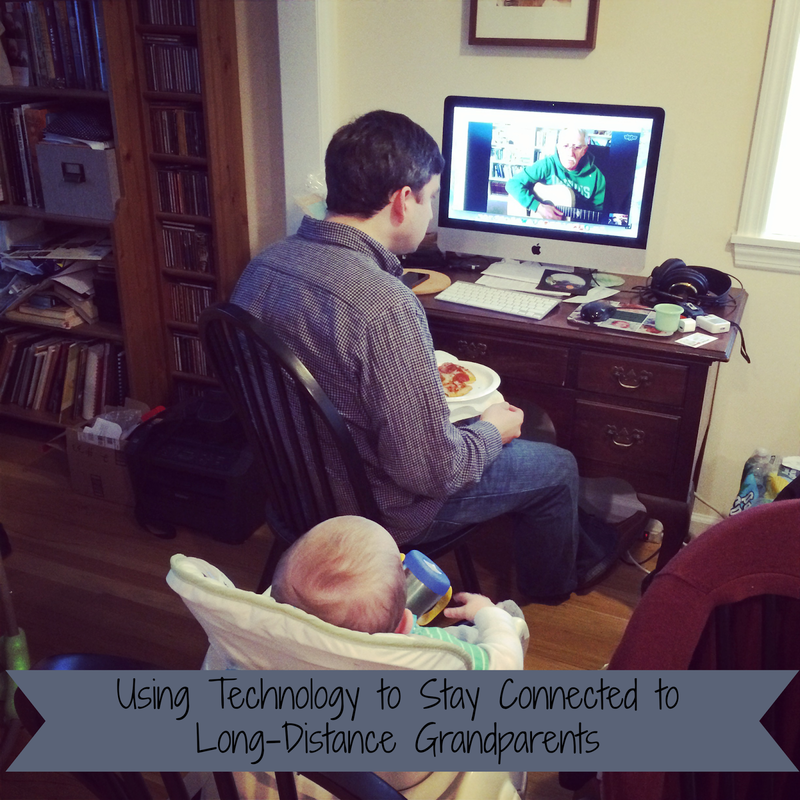 Living in such a technological age makes it easy for us to keep his grandparents abreast of all the minute details in his life, and it helps keep my small son very well aware of the sights, sounds, and laughter of his grandparents.